Without a doubt Fall has now arrived in Vancouver. Warm cloudless days have made way for chilly mornings and dark evenings. In just a few days we will be changing our clocks back. Until November 5th we are looking forward to leaving the office while there is still a sliver a light! Since we will all be setting our clocks an hour back, why not swap out your ho-hum clock for something with a bit more style? We’ve rounded up five of our favorites right now along with a couple of alarm clocks for those of you who have trouble getting out of bed when it is still dark! If you are looking for a clock that makes a statement, look no further than Alessi. This European company has a clock for you no matter what your style is. From the very funky Walter Wayle II wall clock designed by Phillipe Starck to the writable Blank Wall Clock , Alessi never disappoints. Those of us who are on the search for something minimal and refined will love the Ora In/Out. For something more timeless, HAY (another one of our personal favorite furniture and accessory lines) has the Analog clock which will create a bold, yet simple statement on your wall. 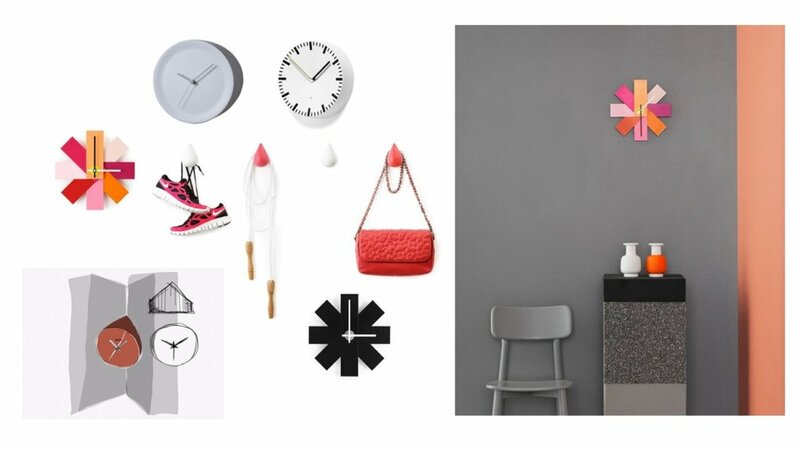 The Watch Me clock from Normann Copenhagen will definitely catch your eye from anywhere in the room. This neutral yet graphic clock was inspired by a fanned out color swatch. No wonder we Interior Designers are attracted to it! Finally, if you are not a morning person, be sure to pick out a fun alarm from Lexon. Our favorites are the INOUT Clock which has a beautiful rectilinear form that has a second mini clock that pops up to display the alarm time. Say goodbye to wondering if you set your alarm clock properly before bed! The FLIP clock available in an array of colors is also easy to use with “ON” written on one of the large surfaces and “OFF” on the opposite side. If you see “ON” it means that your alarm is activated. After the alarm goes off, you simply flip the clock upside-down to turn it “OFF.” No more slapping the alarm off and going back to sleep! For those of you who aren’t familiar with IDS West, you are missing out! Every year at the end of September is a week that most of us in the Architecture and Designer (A & D) community look forward to. 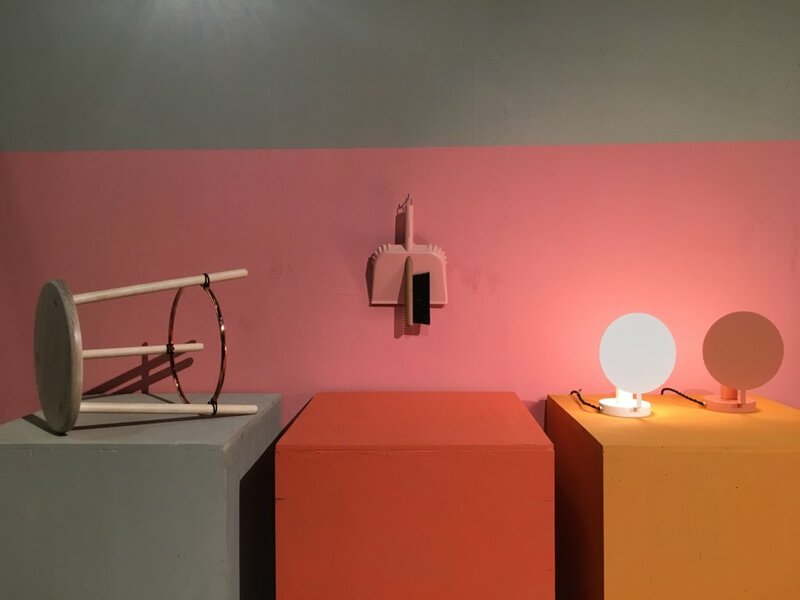 For many years IDS was only on the east coast in Toronto, but since it arrived in Vancouver it has quickly gained traction with not only designers, but also the public. With every year that passes, it seems to get much bigger and better! Not only are there thousands of square feet of trade show floor to explore, but also great talks, seminars and new products to check out. It isn’t uncommon to emerge from IDS a few hours later with lots of new inspiration and a very heavy bag filled with new finds! Read on for our highlights from IDS West 2017. If there is one social event that you have to go to, it is the Opening Night party. This is a well-known fact as the line up to get in was longer than ever, but absolutely worth it. Although the show floor is completely open, it is unlikely you will see most of it as you will find yourself socializing most of the time. The event is a great place to network, catch up with other designers and suppliers! With a live band, strategically placed bars and seating areas, the night will be over before you know it! Fret not, the show is open for Trade Day the next morning and to the public right after that. And if you are looking for more social opportunities, Gray Magazine also hosts a very fun afterparty on Friday night! There is never a shortage of new products at IDS West, but there are a few that caught our eye this year. If you have been reading this blog for awhile, it is no secret that we love all things Scandinavian. We were thrilled when we found out that IDS had a HAY pop-up this year. You could find anything from toothbrushes and towels, to notebooks and trays. It took some restraint not to buy it all! Another fun and clever product we saw was the intelligent wallcoverings and modular accessories for the active workspace by Foster. The wallcoverings are magnetic with fun color and patterns. The magnetic accessories snapped right to them and could be moved around for different types of work! A great system to liven up any workspace whether it be at work or home.